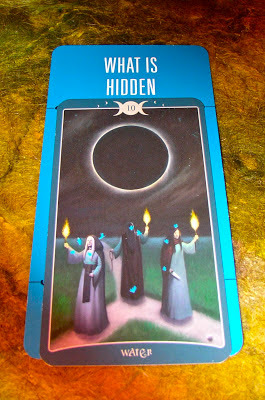 Today's Draw: The Ten of Water in the What Is Hidden position from the Book of Shadows Tarot: As Above and the Deck of 1000 Spreads. Have you been getting signs lately that someone in this world or another is trying to connect with you? Are you just ignoring it and hoping it will go away? What do you think they might be trying to tell you? Something kind of odd is happening as I use my Deck of 1000 Spreads to give context to these daily draws. On the one hand, it's doing exactly what it's supposed to do...put the chosen tarot card in context. But on more than one occasion, the spread position and the card have meant essentially the same thing. For example, last week we had the position of What to Leave Behind, and the card chosen in that position was a person burning the baggage of their past. That answered the question, yes. But the card showed a "leaving behind" in the position of What to Leave Behind. Today is another example of that. We get the spread position of What is Hidden and a card that shows a seeking in the dark for what is hidden. I bring this up as odd, because I don't notice this happening so much in regular readings. But it's happened here a couple of times in a week and it's freaky. So if you ever wonder if tarot readers sometimes get freaked out by what cards say or do, yes, we do. Not often, but even after 25 years I'm still amazed at how this whole process can work. This card depicts Hecate as a triple goddess. She's in charge of the spaces between realms...reality and illusion, life and death...the places where seekers often lose their way. So the Ten of Water brings us to that place of uncertainty and fuzziness that she rules—the crossroads between here and "there", wherever "there" is. She is, in essence the Goddess of what is hidden. And What is Hidden in this case is some sort of connection. There are people you need to find, but don't know how. Or there are spirits—either deceased loved ones or spirit guides—that you need to connect with. Or perhaps a power animal or other guide has something to share with you. Whichever of those options sounds most right to you, you can no longer allow the distance between you and this being to grow. It's time to make the connection. If you're like me, you can think of a number of options. I could use to connect with and strengthen relationships with my spirit guides. I would like to have contact with loved ones who have passed over. For me, I don't know that there's anyone in this realm that would qualify. But if you're estranged from someone who's alive and don't know how to find your way back to them, then that's a situation that would apply here, too. The interesting thing is that I've had some odd happenings lately in my house...sounds. Sounds that sound like someone is in this house, when they're not. All kinds of stuff could be responsible for that, but I've lived here for 13 years, so I know what's what. Some of these sounds are borderline curious and some are just plain freaky. Like the knocking at the window. It's usually just three raps and sounds just like someone's knocking at the window. It often wakes me in the morning. I've got a woodpecker that hangs out in the trees around my house, so I blame it on him. But, honestly, it sounds like knuckles on window. The other morning it happened and I know I wasn't the only one who heard it because all the dogs popped up their heads. But none of them barked or seemed to pay attention to it once it had happened. And it wasn't just one set of three raps, it was three sets of three raps coming from a window that is out of reach for humans. So that makes me think. Is someone trying to get my attention. And if so, what can I do? What can any of us do when we're not familiar with the foggy meeting places between worlds? We can start by getting very quiet in a place with no distractions. We can imagine a white light of protection around us. We can ask who is there for us. And we can listen for an answer. The answer (or images) will likely come to us in our head, instead of being audible to our ears or visible to our eyes. So we have to trust that what pops into our head is real. Another thing you can do is invite the spirit into your dreamtime (invite "only the highest and best" spirits) and affirm that you will remember your dreams upon waking. Or you can go to a medium. It's possible that the person or spirit you'll hear from is not the one you expect to hear from, so keep your mind open. The position this card is in—What is Hidden—could suggest that whoever this is, they could hold some key information for you. Which is why they're trying to connect with you. And if the prospect of that isn't too scary, now is the time to answer the call.